Mini Coupe Concept revealed | What Car? 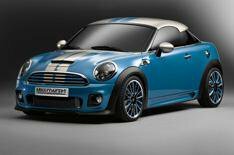 Mini today gave the first glimpse of a new model that could join its range in the future. The Mini Coupe Concept will be unveiled at the Frankfurt motor show next month, on the 50th anniversary of the first presentation of the classic Mini. Strictly a two-seater, the Coupe is claimed to be 'the most dynamic and agile Mini ever built'. At 3.7 metres long and 1.4 metres high, it's a little longer but lower than the regular Mini hatchback. The angle of the windscreen and gentle slope of the roof to the rear of the car are designed to give it a distinctly wedge-like and sporty shape. On the outside, the Coupe shares plenty of familiar Mini design features, such as the large round headlights and hexagonal grille, but unique to this model are its rear spoiler and bonnet stripes that run over the front grille. Inside, the sporty theme continues with heavily bolstered sports seats, a three-spoke leather steering wheel and clocks either side of the rev counter, one of which acts as a stopwatch. The Coupe has been designed to use the 208bhp turbocharged 1.6-litre petrol engine from the existing John Cooper Works model and, like every current Mini, is front-wheel drive. Assuming it goes into production, it should alsoo include fuel-saving technology such as brake energy regeneration and an engine stop-start system.